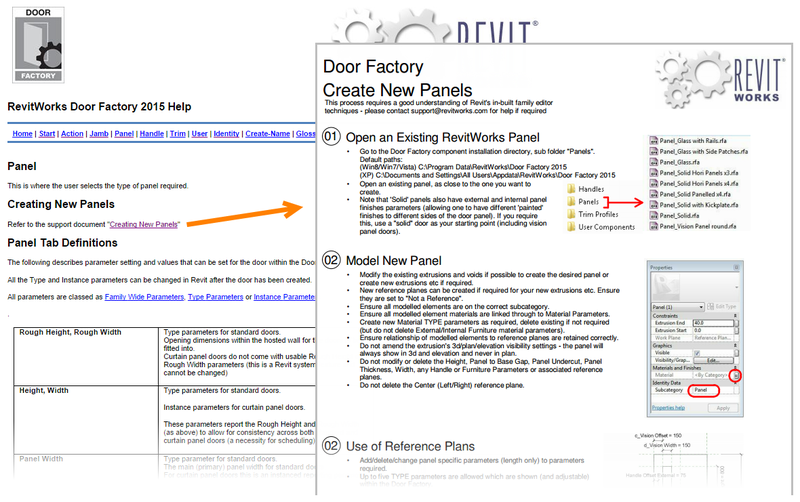 I first posted about the RevitWorks Door Factory add-in back in 2011. A lot's changed since then, and I wanted to do a full-on review of the product, and here it is. "Create almost any door you want in seconds, without going into the family editor." I would just add one word to this statement: "Create almost any door you want in seconds, consistently, without going into the family editor." I don't think it can be understated how helpful it is to have consistent content in one's Revit projects. My setup was a little different than most in that Alex of Revit Works issued me a promo copy, which I downloaded from DropBox. Usually, one would purchase the product from the website. An interesting aside is that there isn't a trial version of Door Factory 2015, per se. 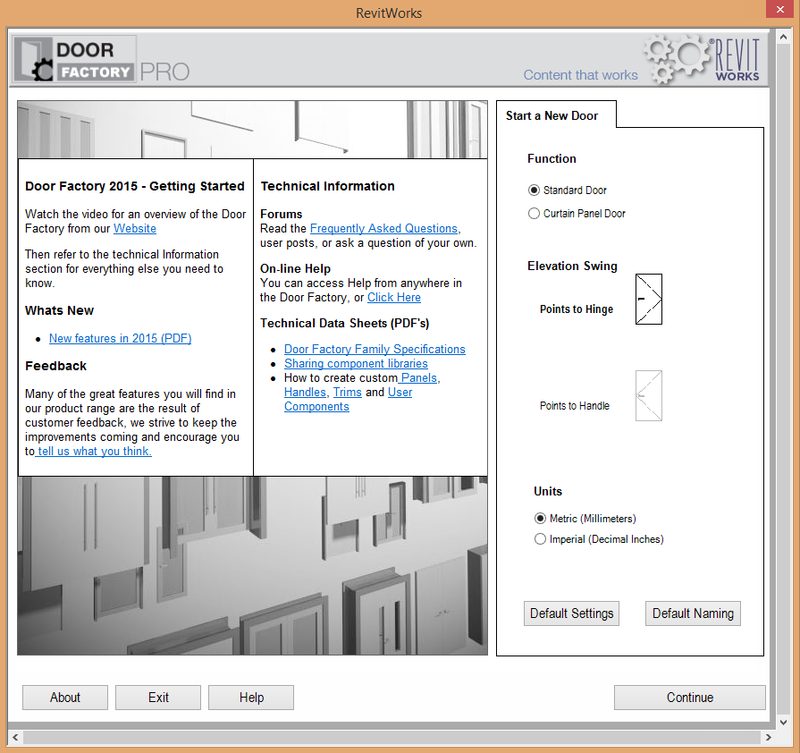 Instead, a free LITE version has been released, which includes "the best single and double swing doors," with the newly dubbed paid "PRO" version featuring more door types, door actions and features. There's an excellent chart about the differences between the LITE and PRO versions towards the bottom of the product page. Once downloaded, the installation was smooth, and featured a professional-looking wizard. 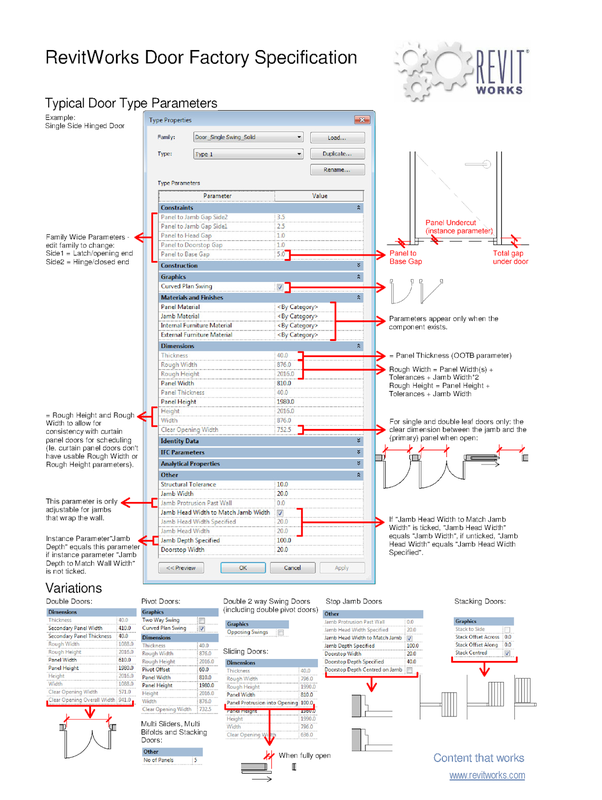 Once Revit was launched, a new tool was available in the ribbon on the Add-ins tab. While not strictly following the Revit interface standard, the icon is attractive and unobtrusive. When I launched the add-in, I was prompted for an activation key. Once I entered it, the key authenticated over the Internet and I was off to the races. Upon launching the application, one is presented with a Start screen. On first blush, the Start screen may seem a little overwhelming, but I equate this to how some use the starting view in Revit to present useful project information to team members. 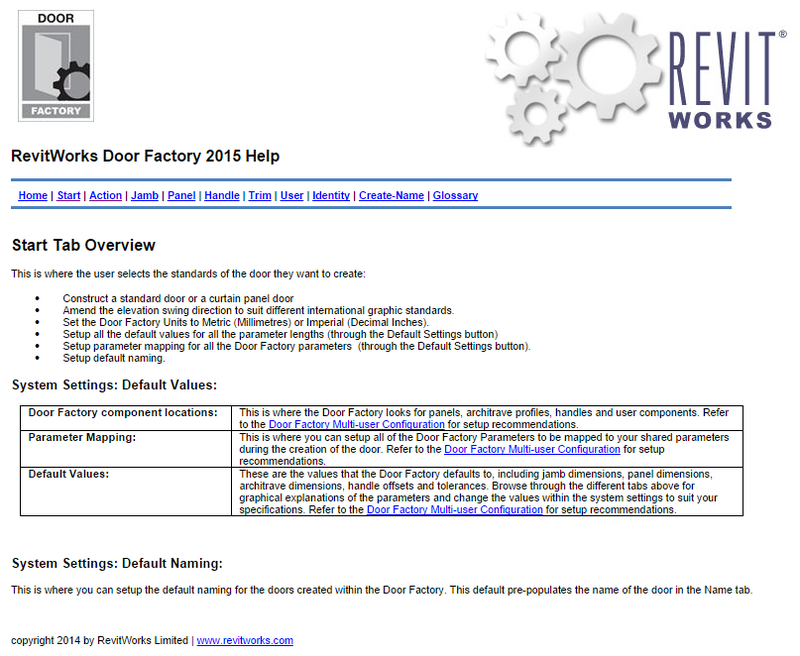 Here there are links for an overview video on the RevitWorks website, a "New Features in 2015" PDF, feedback, a product FAQ, online Help, and several "Technical Data Sheet" PDFs, including "Door Factory Family Specifications" and how to create custom panels, handles, trims and user components. 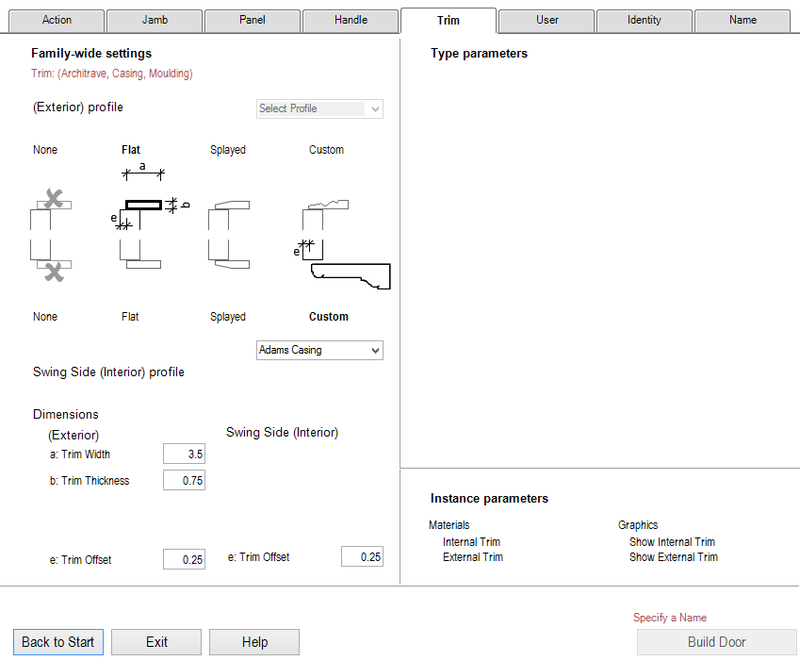 It tells users what to expect from the delivered Door Factory content, such as how it was built, what parameters are used, what parameters can be changed by the user during placement, etc. It can be used as a resource for creating custom content consistent with the delivered content. The Help button is context-sensitive in that it opens the online help to the tab that one is currently on in the dialog box. The level of detail provided in the online help seems adequate. Architects, engineers and technicians are smart people, and I've often thought that the smartest people don't necessarily know the answers offhand, but they know exactly where to go to find them. By including this wealth of resources upfront, Door Factory sticks the landing on reducing the learning curve. On the right side of the Start screen there is a Start a New Door tab with a handful of options. One isn't likely to change several of these frequently though, such as the Units and Elevation Swing (this latter being used to simply define if the swing elevation triangle points to the hinge or to the handle). On the bottom of the tab there are Default Settings and Default Naming tabs. Each opens a corresponding dialog box. In the Default Settings dialog box, one may set the default values for all the parameters. 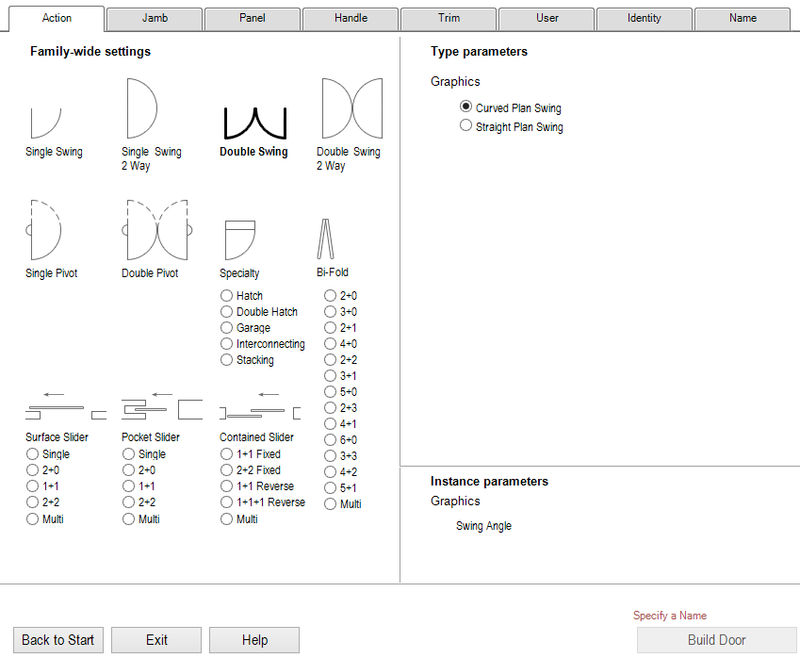 A recent addition to the Default Settings dialog box is Parameter Mapping. 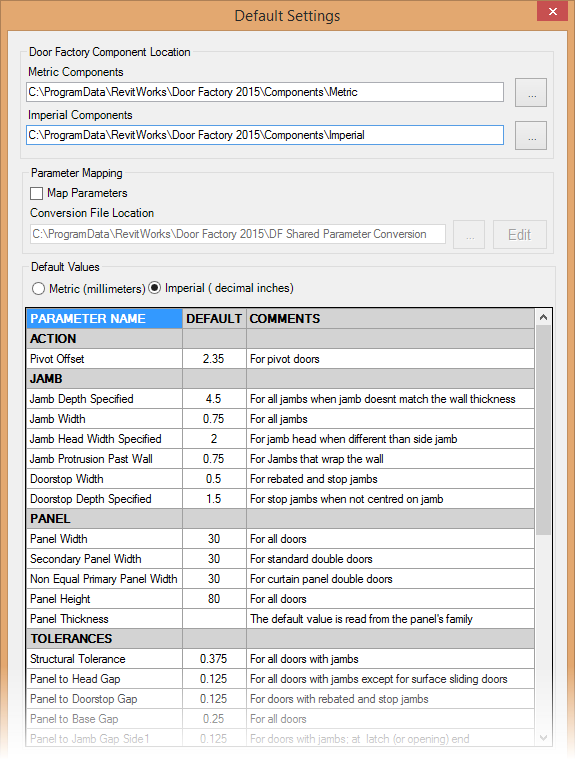 This allows one to map Door Factory parameter names to one's own shared parameter names. 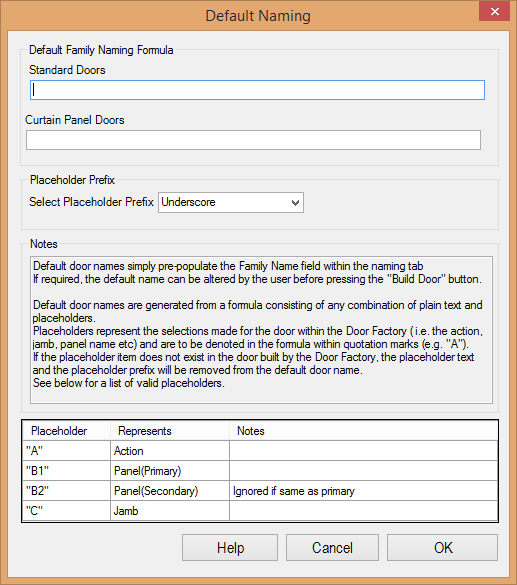 In the Default Naming dialog box, one can setup the default naming for the doors created with the Door Factory. This default pre-populates the name of the door in the Name tab. 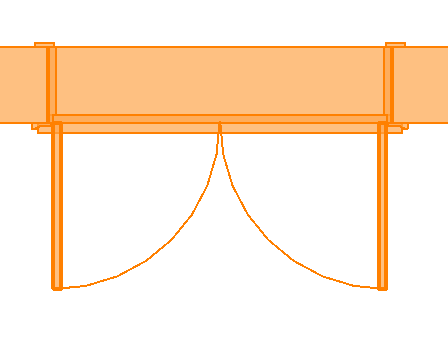 The remaining setting on the Start tab is used to create a Standard Door or a Curtain Panel Door. Clicking Continue displays a second screen with a number of tabs, the first of which is Action. Here's where one can choose single swing, double swing, bi-fold, pocket slider, etc, and there are plenty of options offered. 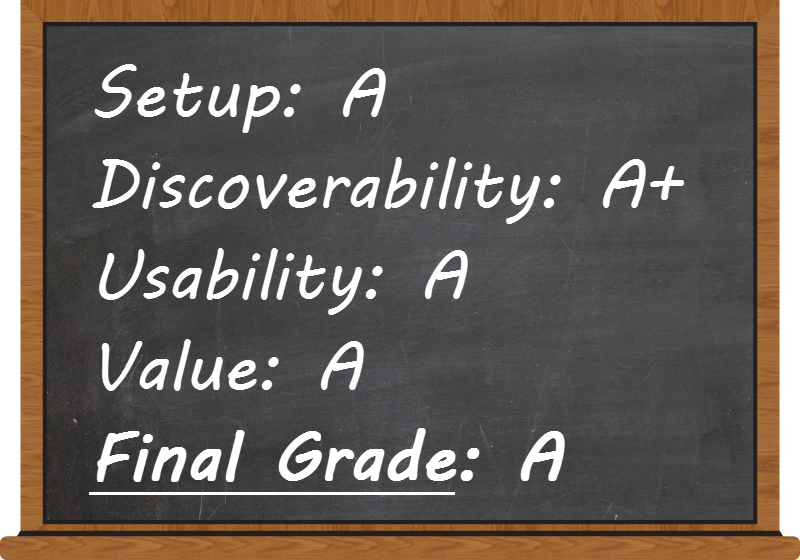 The next tab is Jamb where the user selects the type of jamb required. Again, options are plentiful and on-screen tips make the selection process easier. Next is the Panel tab. 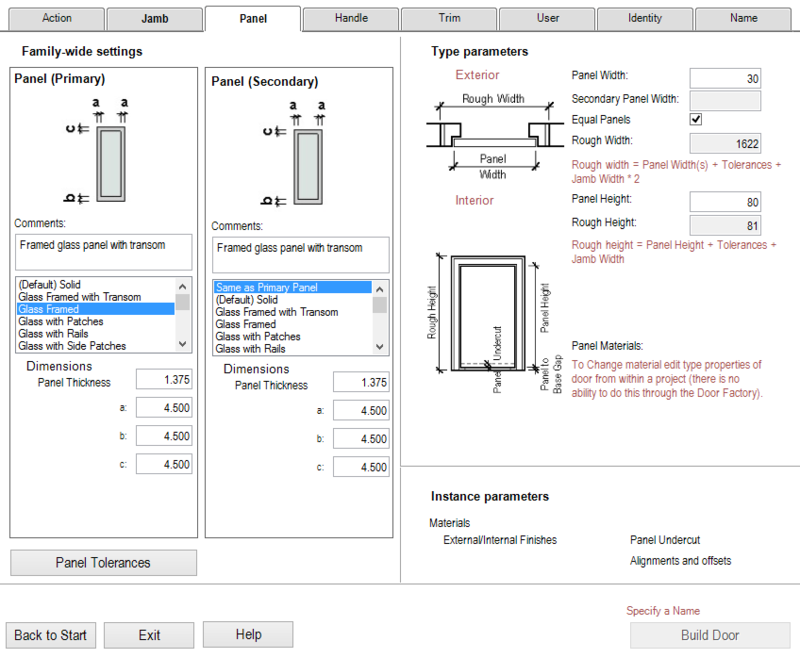 Here the user selects the panel type and size of panel(s) needed. 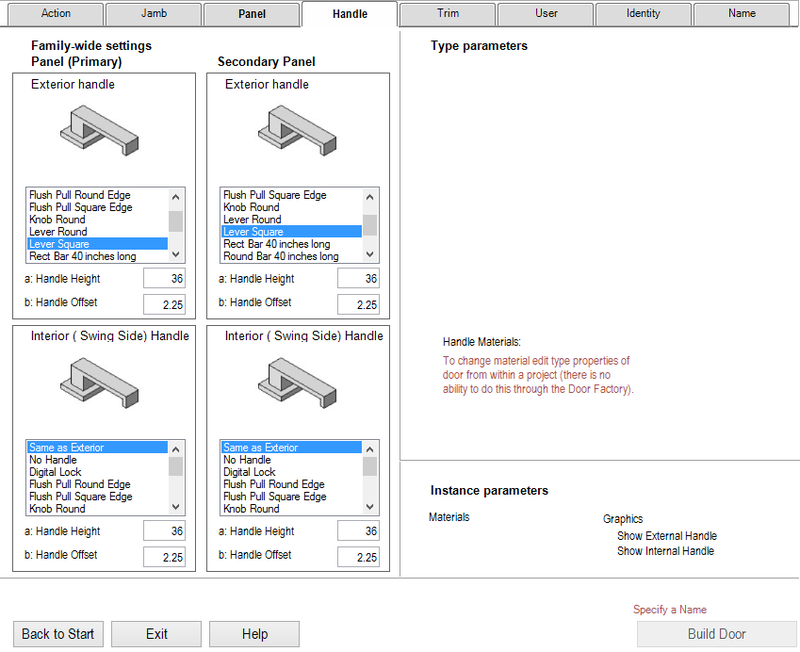 Next is the Handle tab, where the users selects the type of handle(s) to be used. Next is the Trim tab. 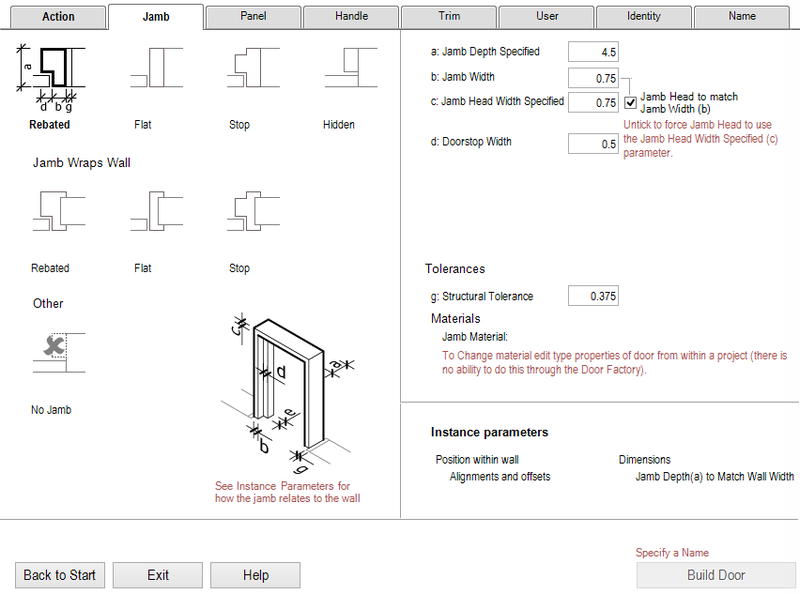 Here the user can select trims for the interior and the exterior of the door. 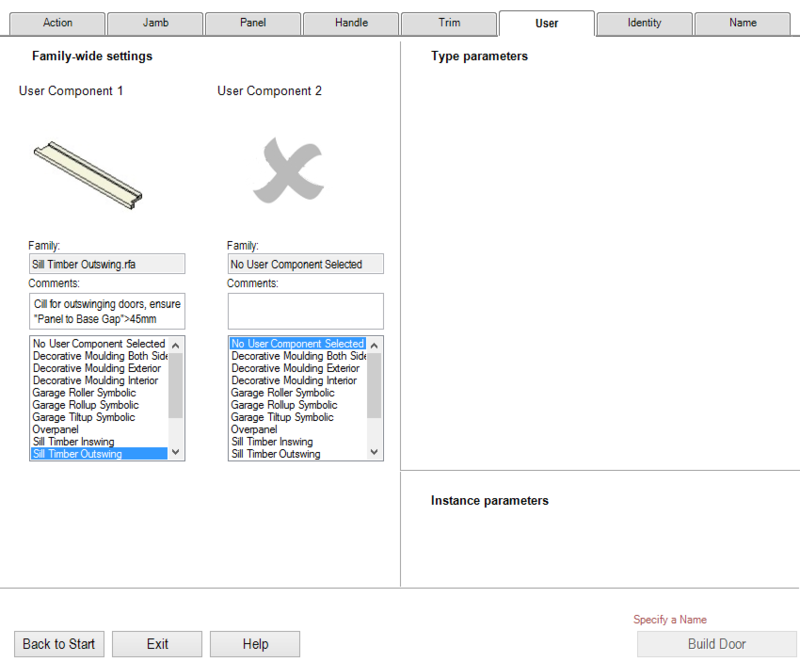 On the User tab, the user can select two “extra” components to be included in the door. The Door Factory comes with a number of user components including sills and sliding door pelmets. 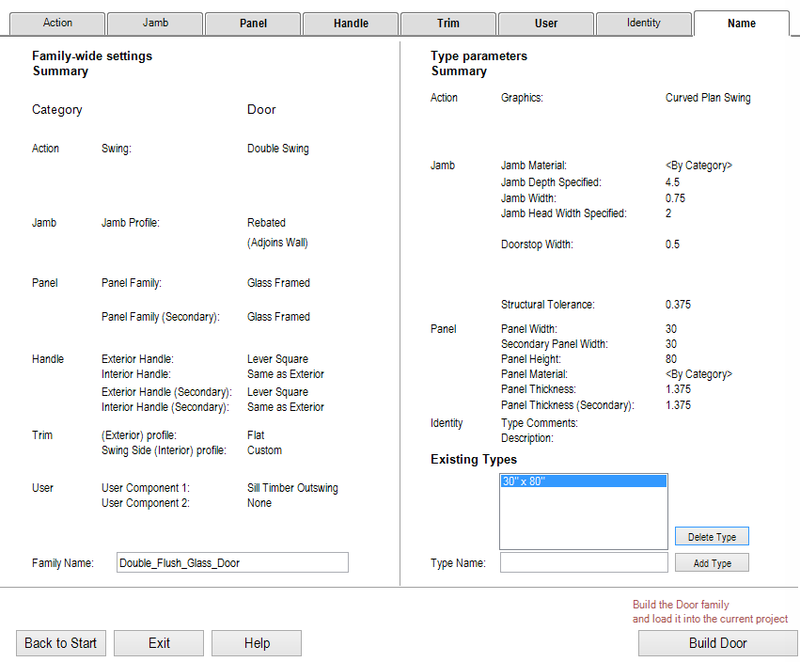 On the Identity tab, the user can fill in Revit system parameters to populate the door with. Lastly, on the Name tab, the user is presented with a summary of selections made and is able to name the family that the Door Factory will create, as well as the type within the family. Clicking on the Build Door button creates the family and loads it into the project. The door may then be placed using the native Place Door tool. After reading through this review, it should be fairly obvious that the appropriately named RevitWorks Door Factory creates new door families from combinations of existing component families such as panels, jambs, trim, etc. A wealth of this component content is delivered with the Door Factory. One can also create new custom content, and links to "how tos" are littered throughout the documentation. The RevitWorks Door Factory starts at USD 350.00 for a single license and then gets progressively less expensive per seat the more that you buy.